The Stereo Omnidirectional System (SOS) is a remarkable 360 degree, no blind spot camera system that is the heart of an intelligent wheelchair. Using camera images, the chair is able to detect obstacles or hazards and stop or manuever appropriately. Engineers included elements of intelligent automotive systems, to guard against front collisions with walls, large objects or other people. It can also detect situations where there is a risk of falling, like an open stairway. Analysis of the picture presented by the camera is done in real-time to guide the wheelchair and keep it safe. The developers liken the problems of the crowded road to those of the crowded sidewalk or hallway. The camera system is also able to watch over the person in the chair, and can detect significant changes in posture which could signal a problem. The intelligent wheelchair can use wireless technology to notify others of a problem. 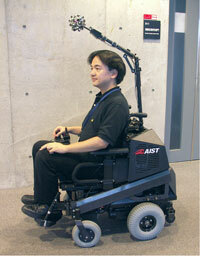 Remarkably, it is also possible for the user of the wheelchair to 'steer' the chair using hand signals. The wireless functionality of the camera system can be used to show the location of the chair to family members or other interested parties on a continuing basis. This could help caregivers or family members keep track of a severely disabled person. The camera reminds me of the recording eye from science fiction author Robert Silverberg's 1969 novel The Man in the Maze. In the novel, thousands of these devices are dropped through the clouds obscuring a planet, to see if lifeforms are present. 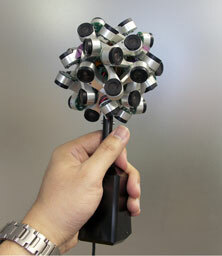 Thanks to pink tentacle; see some cool videos at the Stereo Omnidirectional System press release.